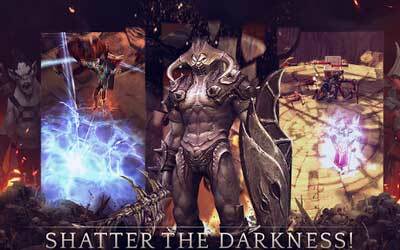 There is new game from GAMEVIL, Darkness Reborn 1.2.9 APK has been released. Great graphic with good features will invite you to enjoy the game. You can download it for free so you can install it to your device now. Just like Dark Avenger, the game formula still dominated by sword swing action with visual display that makes it no less exciting with artificial Gameloft Dungeon Hunter. Comparing with games like Diablo III it’s also not a difficult thing, because many visual assets that make me a glimpse feel dejavu play the game made by Blizzard. At the beginning, you will control Damien, a formidable warrior figure who seeks to defeat the evil dragon Belphegor at the top of a tower. Arriving in the middle of the fight, unfortunately Damien heroic action must be ended with the defeat of death. Worse bodies of Damien actually resurrected into a Fallen Knight. Now everything depends on the successor Damien knight to save the world from destruction. After trying out the playable intro before, I was given the option to choose one of two knights class. Options available include warrior and kunoichi (female ninja). After the selection process and the name of the class before, I was taken straight to fight a series of tutorials that teach me the basic gameplay of Darkness Reborn. If you’ve ever played a game hack and slash in the mobile before, I think you will have no trouble, because to be honest not a new thing that I get in terms of control. Instantly boost your power and speed with RAGE! Lv.2 & Lv.3 update in Awakened Boss Raid! This game is addictive and one of the best. You never want to stop playing until you see the end. Simply put, AMAIZING!